Together with some of my colleagues from my motorized column I followed this second group. As I recall, the NCOs Riedl, Dietrich, Schroff, Hamann, Locher, Ammann, Greule and possibly some others whom I can no longer remember came with us. After we had followed the group for about eight hundred to a thousand metres we came upon two fairly large sandpits. The path we had taken ran between them both. The pits were not joined but were separated by the path and a strip of land. We overtook the column just before we reached the pits and then stopped close to the entry to one of them (the one on the right). I myself stood about six to eight metres from the entry. To the left and right of the entry stood an armed civilian. The people were then led into the gravel [sic] pit in small groups to the right by the guards. Running round the edge of the pit there was a circular ditch which the Jews had to climb down into. This ditch was about 1-5 metres deep and about the same again in width. Since the ground was almost pure sand the ditch was braced with planks. As the Jews were being led in groups into the pit an elderly man stopped in front of the entrance for a moment and said in good German, "What do you want from me? I'm only a poor composer." The two civilians standing at the entrance started pummeling him with blows so that he literally flew into the pit. After a short time the Jews had all been herded into the circular trench. My mates and I had moved up close to the entry to the pit from where we could see clearly that the people in the ditch were being beaten with clubs by the guards, who were standing at the side of the trench. 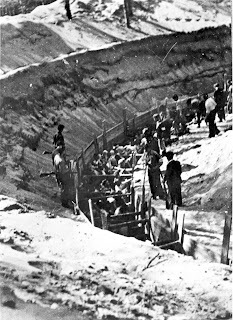 After this ten men were slowly led out from the ditch. These men had already bared their upper torsos and covered their heads with their clothes.... I would also like to add that on the way to the execution area the delinquents had to walk one behind the other and hold on to the upper body of the man in front. After the group had lined up at the execution area, the next group was led across. 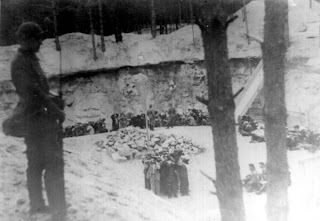 The firing squad, which was made up of ten men, positioned itself at the side of the path, about six to eight metres in front of the group. After this, as far as I recall, the group was shot by the firing squad after the order was given. 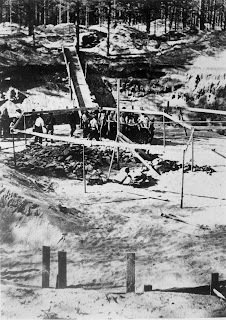 The shots were fired simultaneously so that the men fell into the pit behind them at the same time. The 400 Jews were shot in exactly the same way over a period of about an hour. The shooting happened very quickly. If any of the men in the pit were still moving a few more single shots were fired on them. The pit into which the men fell had a diameter of about fifteen to twenty metres and was I think five to six metres deep. 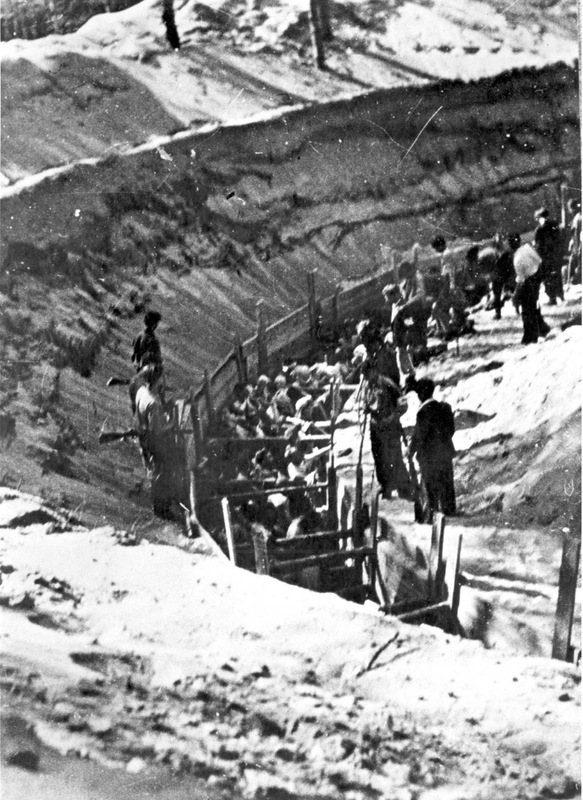 From our vantage point we could see into the pit and were therefore able to confirm that the (approximately) 400 Jews who had been shot the previous day were also in there. They were covered with a thin sprinkling of sand. Right on top, on this layer of sand, there were a further three men and a woman who had been shot on the morning of the day in question. Parts of their bodies protruded out of the sand. 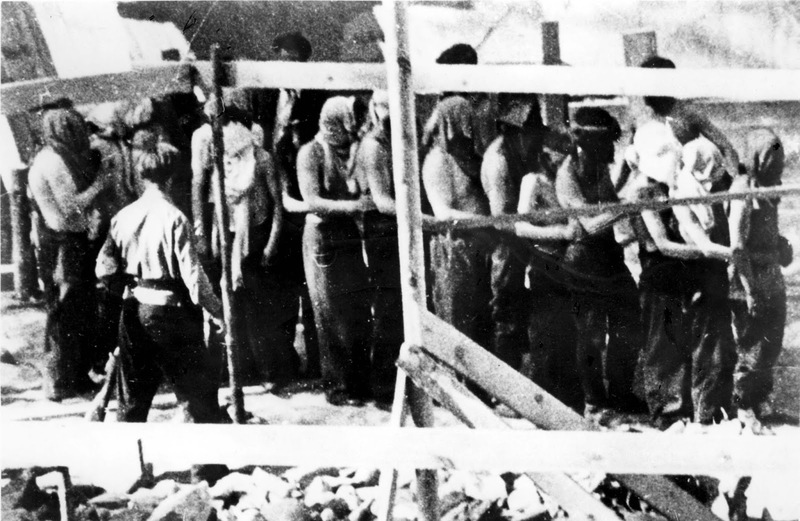 After about one hundred Jews had been shot, other Jews had to sprinkle sand over their bodies. After the entire group had been executed the firing-squad put their rifles to one side. Due to lack of experience, the system of execution changed over time. Initially, people sentenced to death were brought in large groups y cars or trains. 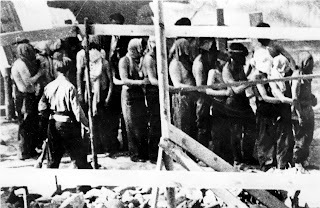 They were forced to stand at the existing pits and were shot with fixed machine guns. However, this did not guarantee that all of them would be dead and consumed a large amount of ammunition. It happened, especially in the initial period, that after some time some injured people managed to get out of the pits of death. After several weeks, the manner of killing was modified. Ten-person groups of convicts were brought to the place of execution. They had to take their outerwear off, and then stand facing the pit, with their backs to the firing squad consisting of ten riflemen. Older children lined up with adults, and smaller ones were held by their mothers. In the latter case, one rifleman pointed at the mother, and the other was to shoot the child. Sometimes, to save ammunition, small children were thrown into the pits alive. Convicts were killed with single shots using machine guns or short rifles. Executioners were trained to ensure the effectiveness of shots. 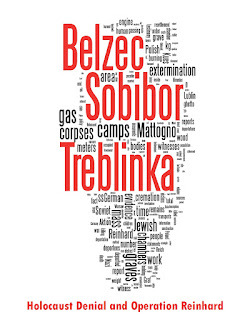 One of the witnesses of the crime, Stanisław Chomiczewski, stated that "before shooting, an officer presented charts showing human figure with the location of vital organs, which the soldiers taking part in the executions were to aim at. After a salvo of the firing squad, the officer would run up to the victims to check the accuracy of the shots according to previous instructions"11. If anyone would give signs of life, they were finished off by the rifleman previously assigned to them. So it looks like the users initially tried a method such as suggested by Mattogno, but then got smart and adopted the more failsafe and economic method that was witnessed by Pflüger. Which means that Mattogno’s musings are more of the "Germans wouldn’t have done it that way" – nonsense that is a staple of "Revisionist" argumentation. But Mattogno doesn’t stop at the nonsense. He spins the conjecture that Pflüger must have been shown the aforementioned photos (which he also thinks were three instead of two, and the provenance of which he doesn’t reveal) and, not knowing what else to say, improvised an improbable story. This is of course an accusation of dishonest behavior against Pflüger’s interrogators (if he had been shown the photographs, this and his related comments would have had to be stated in the interrogation record), and at the same time a revelation of Mattogno’s dishonesty, for he knows very well where those photos came from. They were taken by Pflüger’s comrade Otto Schroff, who in his testimony taken on 5.6.1959 described precisely when and from where he had taken these two photographs. Schroff describes a procedure akin to that described by Pflüger, except that his account suggests that the groups of ten death candidates were shot inside the second pit and not into that pit as per Pflüger’s testimony. The slight difference between Schroff’s and Pflüger’s description shows that neither testimony was in any way used to influence the other. Obviously aware of this, Mattogno withheld from his readers crucial information that contradicts his assertions or conjectures. 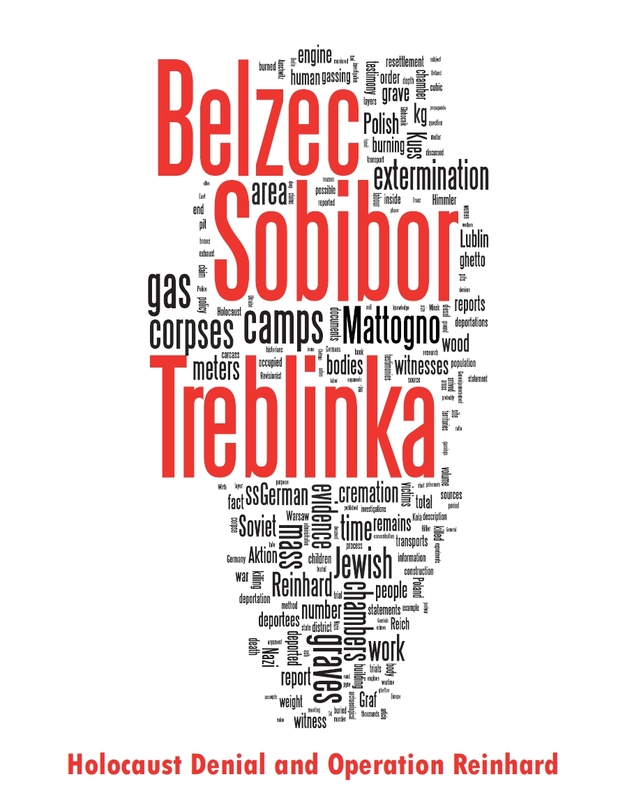 Bottom line, Mattogno’s performance in discussing the mass graves at Ponary is as fraught with ill-reasoning and falsehood as so many other claims and arguments of his that have been dissected on the Holocaust Controversies blog site. His book about the Einsatzgruppen accordingly promises to hold much further evidence that even the flagship of "Revisionism" is a poor researcher who moreover doesn’t shrink from trying to take his readers for a ride. YV Item ID: 100107 YV Title: Ponary, Poland, Jews who were led to the place they will be executed by Lithuanian militiamen, 1941. YV Archival Signature: 75FO4 YV Credit: Yad Vashem YV Places: Ponary,Wilno,Wilno,Poland YV Photographer: Otto Schroff YV additional info: This photograph was taken in July 1941 by Otto Schroff, a member of the 96th Infantry Division of the Wehrmacht, who witnessed the killing of around 400 Jews at Paneriai on three consecutive days. At this site, near the city of Vilna, the Soviet authorities prepared huge pits for storing petrol tanks they still had not filled. During the Nazi occupation, starting 07/1941, they brought Jews, Gypsies, POWs, and Nazi opponents to these pits where they were executed. YV Title: Ponary, Poland. 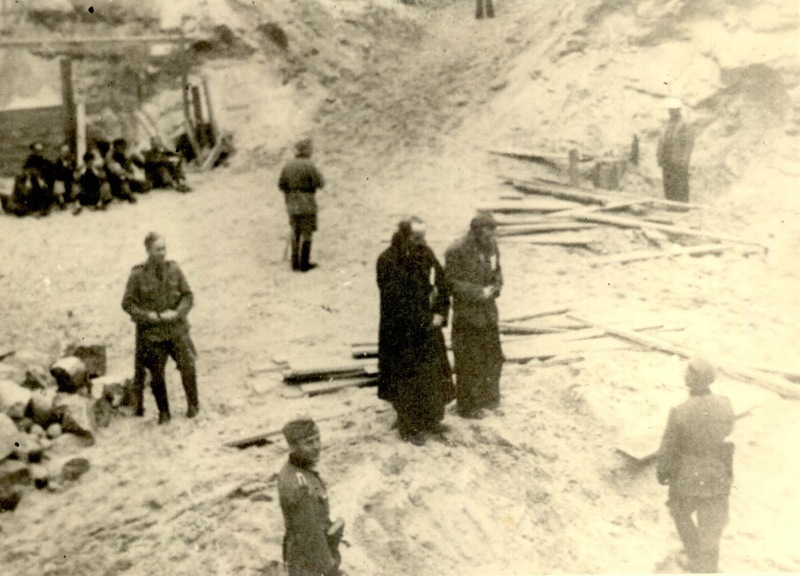 Two Jews just before their execution, surrounded by German soldiers, June-July 1941. Ernst Klee, Willi Dressen and Volker Riess, the editors of the document collection "Schöne Zeiten" – Judenmord aus der Sicht der Täter und Gaffer, 1988 by S. Fischer GmbH, translated into English as "The Good Old Days" – The Holocaust as Seen by its Perpetrators and Bystanders. The enlargement OS2a is featured on page 39, the photos OS1 and OS2 on pp. 40-41 of "The Good Old Days". The collection also contains excerpts from the testimonies of three Wehrmacht servicemen of the 96th Infantry Division who witnessed mass killings at Ponary (pp. 38-39 and 42-45). The first of these is that of a driver surnamed Pflüger, taken on 18.6.1959 ("The Good Old Days", p. 283, archival reference: 207 AR-Z 14/58, p. 1683 ff.). The second is that of a co-driver named Hamann, taken on 5.6.1959 (ibid. p. 1263). The third is that of a bookkeeper by the name of (Otto) Schroff, taken on the same day (ibid. p. 1247 ff.). The text of all three excerpts are transcribed from "The Good Old Days" on this page. Pflüger, Hamann and Schroff also testified in the main proceedings at the trial of Dr. Alfred Karl Wilhelm Filbert (the commander of Einsatzkommando 9, which was in charge of the Vilna area until 9 August 1941 as mentioned in the Jäger Report) before the Berlin Court of Assizes (Landgericht). Their testimonies, along with that of another witness from the same division and a member of the Vilna Field Command Post, are mentioned in the judgment LG Berlin vom 22.6.1962, 3 PKs 1/62, published in JuNSV Bd. XVIII, Lfd. Nr 540 EK 9. Klee et al, ibid. pp. 38-39 and 42-43. "Ponary, the Place of "Human Slaughter"", pp. 17-19.